Adventurer! Make your own cinematic tales of small-time capers gone wrong -- of disastrous situations founded on big dreams and flawed execution, right out of films like Blood Simple, Fargo, and other Coen brothers movies. 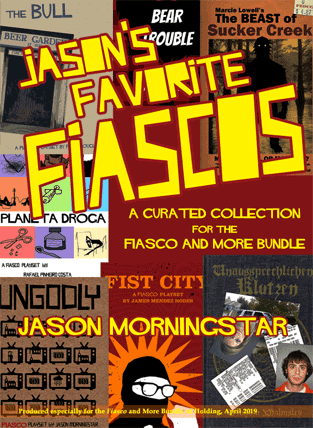 This Fiasco and More Bundle brings you the tabletop roleplaying game Fiasco, its Companion and lots of playsets, and many live-action freeform games by Fiasco designer Jason Morningstar (Night Witches, Durance) published by Bully Pulpit Games. For just US$9.95 you get all six games in our Starter Collection (retail value $42) as DRM-free .PDF ebooks, including the complete Fiasco rulebook (2009), plus the card-based Civil War RPG Carolina Death Crawl; the live-action game Radioactive Bison (which Jason wrote for patrons of the Bully Pulpit d.rip crowdfunding campaign); the freeforms The Climb and Out of Dodge (both previously in our May 2014 American Freeform offer); and the Dungeon World scenario When War Came to Colgur (another d.rip patron reward). And as a convenience to our customers, Fiasco designer Jason Morningstar has curated Jason's Favorite Fiascos, a special collection of seven free playsets that haven't yet been collected anywhere. And if you pay more than the threshold price of $20.60, you'll level up and also get our entire Bonus Collection with five more titles worth an additional $44, including The Fiasco Companion, the Fiasco playset collections Run, Fools, Run and American Disasters (previously in the November 2013 Indie Cornucopia), and the freeform games Winterhorn and The Skeletons. 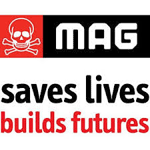 Ten percent of your payment (after payment gateway fees) will be donated to the charity designated by Bully Pulpit Games, Mines Advisory Group. ...But you pay just $9.95 for our Starter Collection of six complete .PDFs, including the Fiasco rulebook and many playsets, as well as three freeform live-action games by Fiasco designer Jason Morningstar (Carolina Death Crawl, The Climb, and Out of Dodge), the live-action game Radioactive Bison, and the Dungeon World front When War Came to Colgur, and seven playsets. And if you pay more than the current threshold price ($20.60), you'll level up and also receive all five titles in our Bonus Collection, including The Fiasco Companion, the playset collections Run, Fools, Run and American Disasters, and the live-action games The Skeletons and Winterhorn. The tabletop roleplaying ebooks in this Fiasco and More Bundle offer retail for US$87. Choose a price you like, in US dollars (minimum $9.95). Make sure you choose an amount greater than $20.60 to LEVEL UP and gain the bonus titles. Just a note: This amount is below the threshold price, so you're receiving only the starter collection. To LEVEL UP and get the BONUS collection, please choose an amount more than $20.60. You're ordering the Fiasco and More Bundle with the account . Right? × It looks like you've already purchased this Fiasco and More Bundle offer with your account address . Thanks! Please log in and visit your Wizard's Cabinet to download your files. Then visit your Wizard's Cabinet page, link up with your DriveThru library, and start practicing poor impulse control. 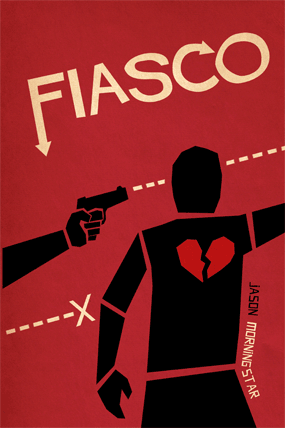 Fiasco is a GM-less game for 3-5 players, designed to be played in a few hours with six-sided dice and no preparation. You'll play ordinary people with powerful ambition and poor impulse control. During a game you engineer and play out stupid, disastrous situations, usually at the intersection of greed, fear, and lust. It's like making your own Coen brothers movie, in about the same amount of time it'd take to watch one. In Fiasco things can go wrong fast. Maybe some dude from a youth group talked you into boosting a case of motor oil, and somehow you wound up killing your cousin in a swamp. Maybe you and your girlfriend figured you could scare your wife into a divorce, but things went pear-shaped and now you're running from a gang of cranked-up skinheads with latex gloves and a pit bull. 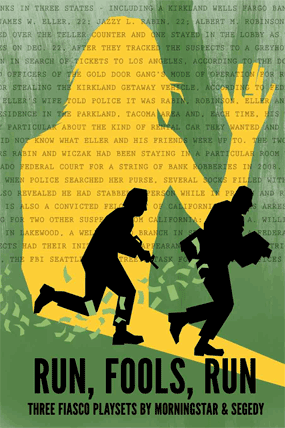 Fiasco is inspired by cinematic tales of small-time capers gone calamitously wrong -- films like Blood Simple, Fargo, The Way of the Gun, Burn After Reading, and A Simple Plan. There will be big dreams and flawed execution. Things won't go well, to put it mildly, and in the end everything will burn in a glorious bonfire of jealousy and recrimination. Lives and reputations will be lost, painful wisdom will be gained, and if you're really lucky, your guy just might end up back where he started. Presented in .PDF, ePub, and Kindle (.mobi) formats. Find many reviews and Actual Play reports at Bully Pulpit Games. Fiasco copyright © 2009 Jason Morningstar. All rights are reserved. At the height of the American Civil War, your characters have been abandoned deep behind Confederate lines. Can they fight their way through enemy territory and treacherous terrain back to safety? For all but one, the answer is "no!" -- but the dark story you tell in trying will be memorable and thrilling. A fun and competitive illustration of the vicissitudes of war and the penalties of treason, Carolina Death Crawl gives you all the history you need -- you supply the desperation, depravity, and destruction. Carolina Death Crawl works best with four players. A session will typically last three hours, depending on your style of play. Download the free rulebook at Bully Pulpit Games. 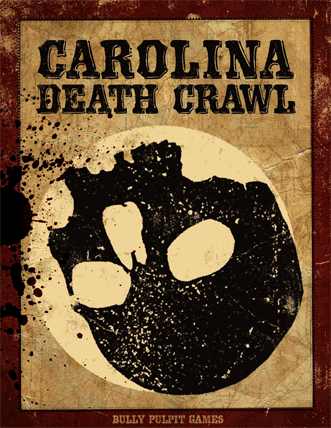 Carolina Death Crawl copyright © 2013 Bully Pulpit Games LLC. All rights reserved. 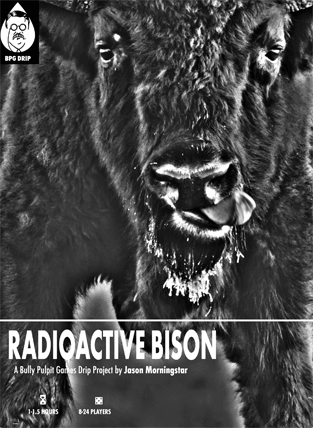 Because of a nuclear disaster in 1986, across Belarus, Lithuania, and Poland one can find roaming herds of radioactive bison that are just doing their thing -- eating and hanging out with non-radioactive bison, and occasionally getting eaten by wolves or prodded by scientists. This is their story. Radioactive Bison is a one-hour live-action game for 8-19 players in a large room (or a grassy field in Belarus). The story continues with the included Bialowieza Fury expansion, which adds to the otherwise pretty chill core game a pack of ten clever, hungry wolves, two forest rangers, and one hapless red deer. Bialowieza (byah-woe-vyezh-uh) is on the border with Belarus, so maybe some of its bison are radioactive. This version works with 12-24 players and takes 90 minutes. Content warnings: Animal predation, nuclear disaster, herd behavior, light touch, loud clapping. Created for Bully Pulpit Games d.rip patrons. Radioactive Bison copyright © 2019 Bully Pulpit Games LLC. All rights are reserved. We have arrived at Camp III, precariously perched 6,900 meters up on a cliff-face high above the Tarphel Valley of Bhutan. In an age of well-trodden paths, no human being has ever been higher on this peak than we are right now. This is a secret first ascent without the knowledge of Bhutanese authorities, who have forbidden climbing for religious reasons since 1994. No one knows we are here. If we descend into Bhutan we will be arrested. If anything goes wrong, there is no one to rescue us. For the six of us on the slopes of the Gangkhar Puensum massif, summiting ensures a place in climbing history. We all want a shot, but only two of us can make it to the top. Who will it be? And what fate awaits the "lucky" ones above 7000 meters? 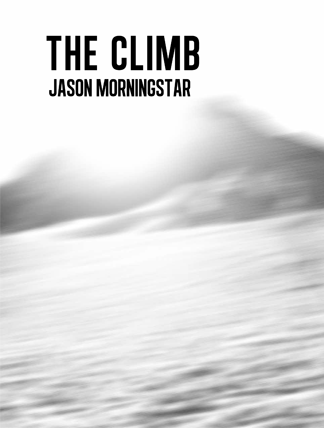 The Climb is a short six-person live-action game about an expedition to a virgin peak in the Himalayas. The game requires six players and a large quiet space; it should take 2-3 hours to play. It helps to have two walkie-talkie radios, though cellphones work fine too. There is no gamemaster, but you'll need one player to organize and facilitate. Includes a 14-page .PDF organized for double-sided printing, which will be used in play as a rules cheat sheet; six individual character sheets; a Summit Team information sheet; a sheet of name tags suitable for printing on labels; and a 91-minute .MP3 snowstorm soundtrack used as a countdown for events during the game. December 2013 Actual Play report from ArCONate (Lombardy, Italy). Learn more at the Bully Pulpit Games website. Oh my goodness did that ever go wrong. Shots were fired, mostly into Toad there, and the four of you got away with a bag containing less loot than you'd planned. A lot less. Now you are on the road, running for your lives and counting your blessings. You have your health (Toad does not have that), you have your friends (not friends), and you each have a still-warm piece tucked into your pants. You have eleven treasures to split four ways and that is not going to be pretty. Things are not looking up. Out of Dodge is a live-action RPG designed for four people (Mole, Rat, Toad, and Badger) on a road trip. You can use four chairs in a room instead if you're not going anywhere. You need a stopwatch, a towel, and a small zippered bag. The game should take less than an hour, about the length of a trip to Greensboro to get ice cream at Yum-Yum's. The game triggers events when players say certain words. The standard game has the words filled in. There's also a form-fillable version that lets you insert new words for replayability. Includes a Taiwanese bearer bond. Don't ask. 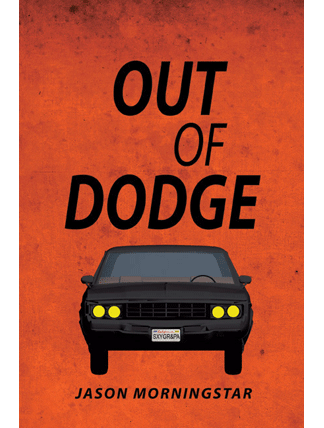 Out of Dodge copyright © 2014 Jason Morningstar. All rights reserved. The village of Colgur belongs to the city-state of Gannd, which is at war with its northern neighbor, Seridus. Thirty-five thousand men of Seridus are on the march. To defend Gannd, the Duke of Bera has paid for the services of the Company of the Bucket, a mercenary band of heavy cavalry, Dwarven crossbowmen, and a Black Hand war magician. Even with their help, Gannd will be outnumbered almost two to one. It is clear the desperate battle will take place within a week, in or near Colgur. A band of heavily armed professional murderers has just arrived in town and is settling down for the night. What do you do? This adventure front for Dungeon World is based on the Battle of Montaperti in Tuscany, 04 September 1260 -- the bloodiest battle in medieval Italy. To play this as a historical scenario, just change the names and get rid of the Dwarves and magicians. Includes a new playbook, The Villager. Created for Bully Pulpit Games d.rip patrons. 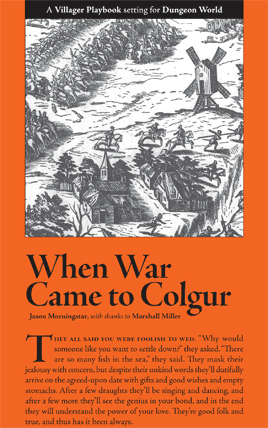 When War Came to Colgur copyright © 2018 Bully Pulpit Games LLC. All rights are reserved. As a convenience especially for purchasers of this Fiasco and More Bundle offer, Fiasco designer Jason Morningstar has gathered seven of his favorite free playsets, by diverse hands (including his own), that haven't yet appeared in any anthology. Includes new commentary by Jason, along with his list of more great playsets available elsewhere. Find links to all these playsets and hundreds more at FiascoPlaysets.com. Jason's Favorite Fiascos copyright © 2019 Bully Pulpit Games LLC. All rights are reserved. 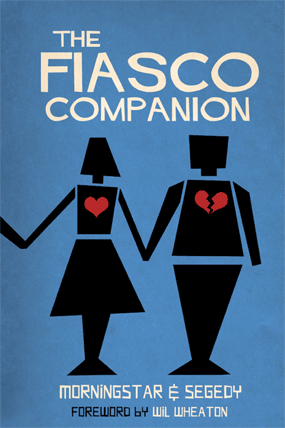 The Fiasco Companion includes in-depth discussion of common pitfalls and solid techniques for making Fiasco games excellent, as well as advice for writing your own playsets and hacking the rules. In addition, the Companion features exciting rules variants, new Tilt and Aftermath tables, and four new playsets (Fiasco High, Regina's Wedding, Vegas, and Mission to Mercury). Foreword by Wil Wheaton. The .ZIP archive includes two supplements (Gangster London: Writer's Edition and Mission to Mercury Technical Data + Bonus Material). The Fiasco Companion copyright © 2011 Bully Pulpit Games LLC. All rights are reserved. Run, Fools, Run is a collection of highly polished Fiasco playsets themed around organized stupidity. Each manages to bend the time-tested Fiasco framework in new and exciting ways. With something dangerous, idiotic, or just plain cringe-worthy on every page, Run, Fools, Run will kick your next Fiasco session into high gear. The Last Heist: Pull on your ski mask and get ready! Your crew of criminal geniuses is about to commit an ambitious robbery, and not for the first time. Let's hope it goes better today. This playset includes a hack for "Heist Dice" to add some extra twists to your story and better emulate bank-heist films. White Line Fever: You are an extremely unlikely group of individuals hurtling down the highway in a 1973 AMC Matador. How did you get here? Why are you going so fast? The answers, and your destiny, are all right here in this cramped '70s muscle car. The Murderists: You've got a contract, advance money, and a dossier on your target. You may not get along with your team, but you're professionals so you'ill get the job done. One problem: You're pretty sure one of your team is a snitch, or worse, a Federal agent. Time to clean house. Run, Fools, Run copyright © 2013 Bully Pulpit Games LLC. All rights are reserved. 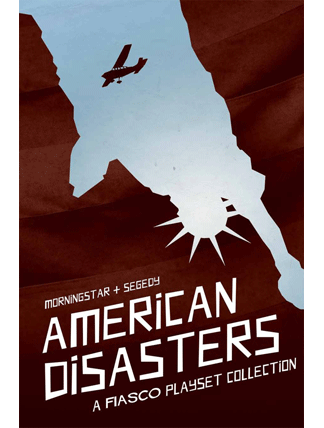 American Disasters is a collection of three highly polished Fiasco playsets along with new optional rules for extended campaign-style play. These rules, called Trainwreck Mode, offer a new experience for veteran Fiasco players. Trainwreck lets you chain together multiple sessions and playsets for a longer, richer, and more catastrophic story. These three playsets were written and developed in-house and chosen specifically for this collection to match the Trainwreck rules. They're all heavily-playtested and proven fiascos! Business Casual: Pour yourself a cup of terrible coffee and enjoy this snapshot of life in a corporate IT office, complete with cubicles, malfunctioning copiers, and impotent white-collar rage. It's the Monday that never ends. Rainbow Mountain: Join Michael Tree and his family and build utopia on a few perfect acres of mountain land, far from the troubles of the modern world. Well, except all those problems you brought with you. Poppleton Mall: Visit our shops during the holidays, when Santa reigns over his throne room and the atrium rings with the sounds of merrymaking from the magical Winterland stage. Your children will always remember their visit to Poppleton Mall! 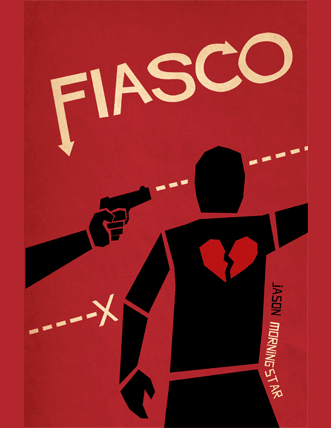 Fiasco: American Disasters copyright © 2012 Bully Pulpit Games LLC. Winterhorn: the code name of a small but passionate group of "peace and justice" activists. On the surface they project innocent, if misguided, zeal -- but you know better. As government agents, your goal is to nudge them into destroying themselves, using every trick in the book: black bag jobs, disinformation, spinning up rival front groups, and escalating to vandalism and violence when necessary. Your mission, with the full force of the government behind you and time running out, is to get Winterhorn's members fighting like rats in a bucket. They need to fall apart before they can hurt anyone, and the state's hands need to stay clean. 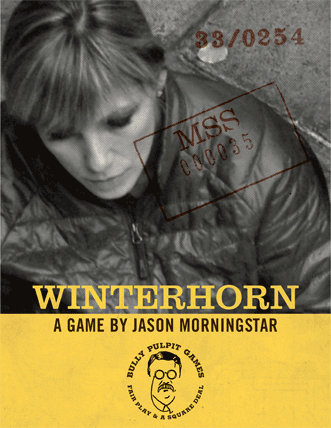 Winterhorn is a live-action game for 3-8 players about how governments degrade and destroy activist groups. By playing law enforcement and intelligence operatives working diligently to demoralize and derail, you'll learn about the real-world techniques used in pursuit of these goals. By playing Winterhorn you'll have a chance to reflect on weak points in your own activism, and think about ways to harden organizations you care about against government intrusion. Winterhorn is a 72-card print-and-cut set of full-color cards plus 30 pages of instructions and printable handouts. Download the full rules and handouts at Bully Pulpit Games. Winterhorn copyright © 2017 Bully Pulpit Games LLC. Years fly by like dead leaves. Everything is darkness and silence. You stand vigilant before the sarcophagus without thought or breath -- such is your compulsion. You do not remember your name, and still you watch. The flesh has fallen off your bones, and still you watch. Then one day there is light and motion and you weigh your axe and raise your shield, lusting for the fray, eager to measure your skill against these tomb-robbing children full of blood. You'll never be alive again, but in this moment -- in the chaos between violation and destruction -- you truly live, and you remember what you once were, and you taste the sun. 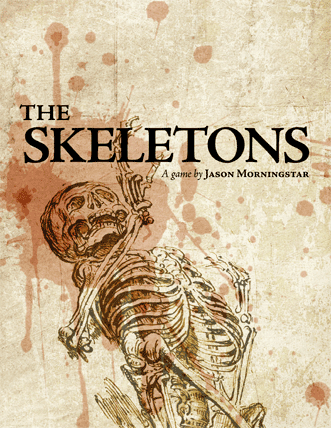 The Skeletons is a meditative structured freeform game for 1-6 players. The Skeletons flips the script on the classic dungeon crawl -- here you play not the intruders, but the guardians, cursed to spend all eternity defending a tomb. As time passes, both the tomb and its guardians change. Ferocious battles are fought and won, and the skeletons slowly remember who and what they once were. Melancholy, introspective and spanning epochs, The Skeletons is unlike anything you've ever played. Download character sheets and a free soundtrack at Bully Pulpit Games. The Skeletons copyright © 2015 Bully Pulpit Games LLC. All rights are reserved.